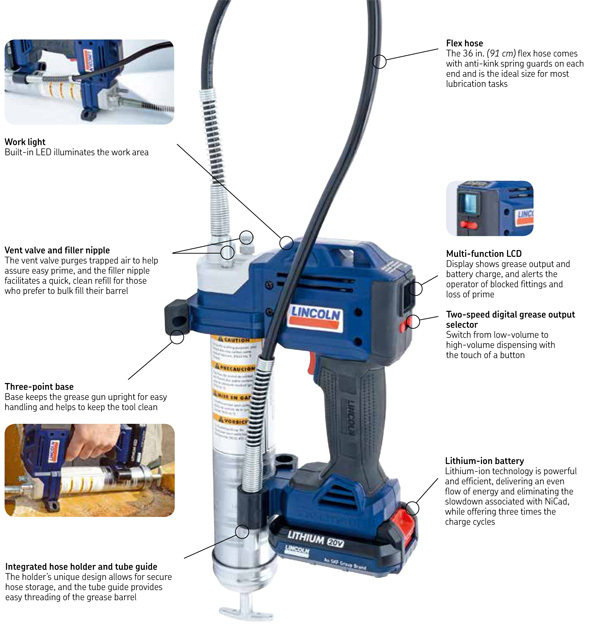 The PowerLuber’s redesigned, hightorque powerhead delivers grease at up to 10 000 psi (689,5 bar) in both highand low-output settings. The new design reduces battery load and maximizes grease output per charge. The tool’s liquid crystal display (LCD) accurately indicates standard readings such as battery level and grease flow (grams or ounces). In addition, the LCD’s flow meter detects the loss of prime, eliminating false readings to help ensure the equipment being serviced is properly lubricated. The rugged PowerLuber’s new three-point base keeps the tool upright and stable for easy handling without being bulky to allow easy access to fittings in tight spaces. Also, the tool has a convenient, built-in LED to illuminate the work area.